I think I'm getting restless and I certainly confess to a huge element of eco envy, having recently spent time with a couple of chaps who are passionate about their electric cars....and...wait for it.....can also charge them up from energy that has been harnessed by their solar panels. Yes, no longer satisfied with reducing my rubbish and fighting the good fight to keep our energy usage down, my mind has been wandering in the direction of other ways in which we can reduce our carbon emissions. And with petrol prices going up and strikes being threatened, I can't help but think about the future of my car. And herein lies my quandary. I have a six year old 1.4 VW, which only does 2,500 miles per year. It's now costing me over £60 in petrol to fill up the tank and for that I get around 300 miles. I am not a heavy user. I try to restrict my journeys, walk when I have time and use my bike much more in the summer. So this car of mine should last me for another ten years at least. However, that's a decade of higher fuel costs and constant carbon emissions. But the cost of switching now seems too much of a barrier , so it was interesting to have the opportunity to pick the brains of broadcaster Mark Goodier, who has been driving electric cars since 2003 when he first leased a Ford Think. 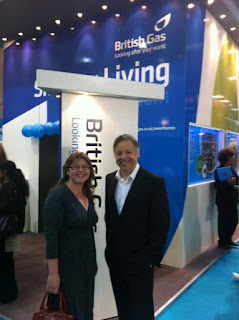 I caught up with him at the British Gas stand at this year's Ideal Home Show. Mark's own switch to EV was very much prompted by the congestion charge in London and leasing the Think meant that not only did he save on the urban driving charge, but also insurance and service costs went down. With no road tax to pay and running on electric power, annual motoring costs became much cheaper still. Mark now drives a Nissan Leaf and a year ago he also upgraded his home with Solar PV. Thanks to the feed-in tariff he can now effectively run his car from free energy sources. This is backed up by his subscription to British Gas' green Energyshare tariff, which uses alternative energy, so either way he ensures his car runs 100% free of emissions. I have to confess, he was doing a really good job of convincing me and we soon started to estimate projected savings if I made the switch. Without exact data it's tricky but even with estimated petrol costs at £2,500 per year, Mark calculated that the equivalent cost in terms of electricity would be around £500. So over just five years, that could mean a saving of £10,000 alone. Extrapolate that to 10 years and we're looking at £20,000. Now, I am starting to get excited. Throw in free Road Tax, cheaper insurance and service costs and we could notch that figure up by a couple of thousand pounds. Suddenly, it does make the switch to an EV more attractive. And then there's the thought of never having to visit a petrol station ever again. Seriously, if I had the cash, I'd be going on a test-drive and would be choosing the right car for me right now! But I don't have that money and realistically I've got more pressing issues on the domestic front, such as how we can turn our 3 bedroom semi into a TARDIS to accommodate our everyday living requirements. That's where we need to spend our cash for the foreseeable future. However, I am not going to take my sights of making the switch and if I am honest, it's trading in my husband's car that would bring us most benefits, both financially and from a carbon saving perspective. Swiftly approaching 100,000 miles on the clock, in a car that is also just six years old, it illustrates how his mileage easily exceeds mine. So I reckon we'll sit tight for a couple of years whilst the next phase of the market settles and wait for the right car to come along. Mark Goodier predicts that we will see more accessible options by 2013/14, which really isn't that far away. By then, he also forecasts that we will see faster charging points that achieve full charge within just 25 minutes. Private charging points, such as those provided by British Gas, will be bolstered by a wider network of public charging facilities, including supermarkets and motorway stations. Chains such as Little Chef are already committing to installing facilities for its customers. We will also see inductive chargers being installed in parking bays, which will make charging electric vehicles even more streamlined. And as for the cars themselves, he suggests that as well as prices moving in line with petrol vehicles, there will be options that will enable the customer to purchase the car but lease the battery. Meanwhile he predicts that petrol models will become more efficient too. It really feels that the electric vehicle market is starting to pick up pace, and for the first time I am beginning to feel that the next time we trade in one of our cars, we will be looking at an electric alternative. The only thing that isn't clear is which car that will be or whether by then, we will have become a one-car family. So, can you see why I'm getting restless? Having had the chance to talk to Mark Goodier, I am now convinced that EV is the way to go. But the observant ones among you will have spotted my mention of two chaps. Yes, it's true, I also had the delightful opportunity of finding out more about the actor\presenter Robert Llewellyn's experiences too, another strong advocate who I met at a campaign launch party. But don't take my word for it. If, like me, you are keen to find out more, check out the video below, which is the first in the Fully Charged series that he has recorded as for British Gas. Blogger disclaimer: This is not part of the sponsored post series that I have written for British Gas. However a complimentary ticket was included to gain acess to the Ideal Home Show. Clean and free energy is the way to go for a cleaner waste free environment. The UK climate is very kind to car batteries: extreme cold crimps the driving range, while extreme heat does a number on the lifetime. If you can power it cleanly you're a green hero! But I'm confused: if your current car requires 20p per mile to drive (£60 for 300 miles) and you drive only 2500 miles per year, your annual gasoline expense should be £500. Where does the £2500 figure for petrol come from? When I did the sums I came to the conclusion that, while from the carbon perspective you want to do it tomorrow, it's expensive to trade in your car for a sipper, even at European gasoline prices.